My flight from Los Angeles to London on United was a comfortable, consistent, and frankly boring. That’s a good thing on a flight you just want to sleep on. I reviewed this very flight two years ago and not much has changed. The menu looks a bit different and there’s a new amenity kit, but the service was excellent, food tasty, wi-fi worked well, and I was able to sleep. While United won’t win any awards for best business class product, it offers a consistent and comfortable flight experience. After visiting the beautiful new Polaris Lounge, I boarded the flight around 4:45PM. Stepping onboard, the purser welcomed me at Door 2L and directed me right toward the rear business class cabin. United’s 787-9 aircraft do not feature the carrier’s latest Polaris business class seats. Instead, United uses B/E Aerospace Diamond seating in a 2-2-2 configuration. These seats are great for traveling with a friend or loved one, but less so if traveling alone with a stranger next to you. Window seats do not offer direct aisle access. Business class features 48 seats in total spread over two cabins (with a galley and lavatories in between). That said, they are comfortable seats and I have no trouble sleeping in them. Tonight’s flight was lightly filled and the seat next to me remained open. United still offers the best bedding in business class, with a mattress pad upon request, a plush pillow and cooling gel foam pillow, and a comfortable blanket. With air vents available, I slept very well. The purser on the flight was an older gentleman who took a very proactive approach to service. He ended up working my side of the rear business class cabin and was a class act. He was friendly and professional without being overbearing or chatty. I also appreciated that rather than perform a formal breakfast service before landing (with all the cabin lights turned up), he approached passengers in business class as they woke up and offered them breakfast. For example, I woke up with about 52 minutes left before landing. He promptly appeared at my seat, offered me a hot towel, then choice of breakfast. The breakfast was served moments later. That takes a bit of coordination and planning, but makes for a better passenger experience. Perhaps this sort of service was due to the cabin only be booked about 33/48, but I liked it. The purser also introduced himself to each passenger while handing out the menus and actively monitored the cabin. I’ve seen so many pursers (or International Service Managers as they were called on the Continental side) just hang out and not do much. This particular purser took a very different and refreshingly hands-on approach. By the way, it was a beautiful evening departing Los Angeles and we had virtually no wait for takeoff after our on-time pushback. Slippers are also available on-demand, but not proactively offered. Pajamas are only available on flights longer than 12 hours. Wireless internet worked well onboard. Not fast, but the connection was stable. That’s an amenity I appreciate so that I can stay connected to office e-mail and messaging. Since I slept for most of the flight, rather than pay the $36.99 for a flight pass I paid $14.99 for a two-hour connection that could be paused when not in use. United’s IFE library contains over 200 movies as well as TV shows and a limited musical and audiobook selection. The 787-9, at least my aircraft, had no games. United offers noise-cancelling headphones that are hardly exceptional, but function well. I watched RBG, a documentary on Supreme Court Justice Ruth Bader Ginsburg. I avoided all alcohol and just stuck to water. That’s not an indictment of the alcohol on United as much as my desire to skip on the unnecessary calories. Prior to takeoff, the purser offered a choice of sparkling wine, orange juice, or water. This is the new standard offering on United, though the entire bar is open if you request it. Meal service began very quickly after takeoff with a choice of drink and warm mixed nuts. The appetizer included tuna and a salad of cabbage and mango with Asian Sesame dressing. The warmed rosemary and pretzels rolls were very tasty. For my main course, I chose fish, served with vegetables and risotto. It was nicely presented and tasted great. In fact, I’d rate it my best meal on United since the surprisingly excellent steak I enjoyed flying from Tokyo to Los Angeles last year. Next, I had a cheese course. I really wish United would offer better biscuits than the water crackers offered. I finished off the meal with an ice cream sundae with chocolate, walnuts and whipped cream. Prior to landing, I enjoyed the fairly spicy Southwestern omelet with chicken sausage and potatoes. Fruit, yogurt, and a croissant were also included on the tray. The cup of illy coffee with breakfast was quite strong and hit the spot. For such a light flight load, the lavatories stayed fairly busy. Both times I had to use the lavatory there was a wait. You’ll find more Cowshed amenities inside the lavatory. Before landing, FAs distributed immigration cards and fast track immigration passes for business class passengers. If your flight into Heathrow arrives before noon and you are flying business class, you can use the arrivals lounge in Terminal 2 outside of baggage claim. Due to strong tailwinds, we landed 30 minutes early at London Heathrow and I was soon on my way to Terminal 5 for my connection to Frankfurt on British Airways. Why not fly on United all the way to Frankfurt? Lack of upgrade space. 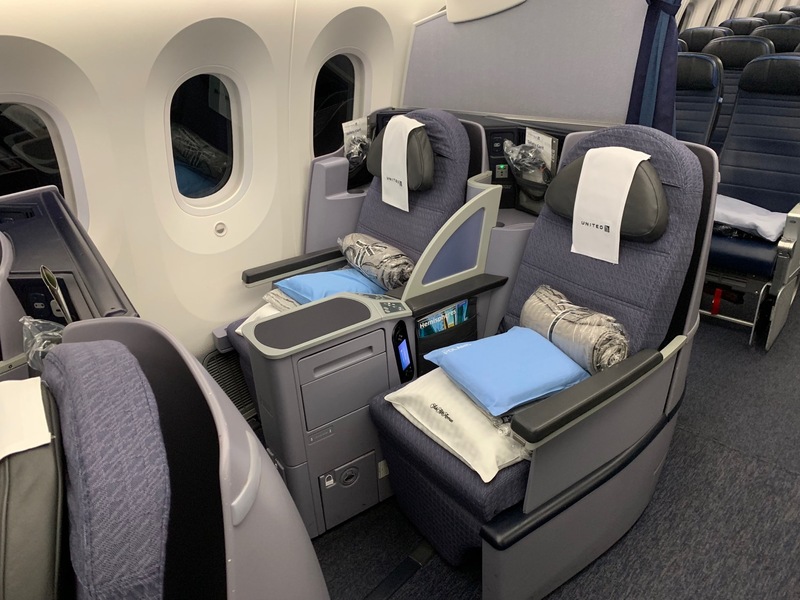 I figured taking the LAX-LHR flight with an upgrade then spending another 7,750 Avios for a business class ticket from London to Frankfurt made more sense than flying EconomyPlus to Frankfurt on United. I was not disappointed. Again, United probably won’t “wow” you on anything but the bedding. But the product is consistent and comfortable and that counts for a lot on my book. The menu descriptions are quite funny. I’m surprised United doesn’t offer a “seared” sundae. My family probably had our best sleep on this very seat compared to other airlines reverse herringbone seats… and the 2x seats make it easier to keep an eye on your kids. This config is a very family friendly config. I believe the Supreme Court justice goes by the moniker Ruth BADER Ginsburg. Sure, she may badger an attorney in court, but that’s something else entirely. Lol. Blame auto-correct for that one. The same for NOICE in the sentence above RBG? As I always say, UA is bound to be perfect for the business traveler. You aren’t going to remember your flight months later, but that’s true both in the positive and the negative. If you’re traveling alone, why not get one of the middle set of seats so you’d have direct aisle access regardless? I get you’d miss out on the picture of the night sky, but it’s only one pic. If you’re asking me specifically, I generally like the K side (far window) because you have views of central London on a clear day. But I’ll take either window because I like my breakfast picture to be in daylight, not darkness. The games have been removed for an IFE upgrade and will return once the fleet-wide upgrade is complete. I was under the impression that the only thing “consistent” about UA is their inconsistency, so I’ve actively avoided flying them these last few years. Still, glad to hear that you had a great purser, good service, and decent meals. Aside from the strange-looking croissant, the food actually looks appealing. They were still serving even as we began our descent into London (after captain’s announcement). I agree that I would have been ticked if I had missed breakfast, but this struck me a crew that would have offered yogurt, coffee, and a croissant even during the final moments of the flight. With the exception of the mattress pad, it’s all on your seat upon boarding. Amazing that the food Just. Never. Changes. They go for years w/the same mediocre appetizer and entrees. UA is pretty much at the bottom among the major airlines for on-board food and beverage (I hear the Polaris food is good, but I have not yet flown through a hub that has one), particularly since BA has improved. I’ve wondered why they cannot spend their money a little more wisely and just have the food a little better and a little more variety. When I get rerouted on LH, or happen to be taking AF or BA now, I find that I look forward to the on board dining, which is not something I can ever say about UA. I suspect this hurts them with the market that pays for full retail for business class ($6K and up), but considering how the Polaris quality has been eroded since it was rolled out, I suspect they have decided they cannot compete there. What airline would be your first choice in business class between LAX and LHR ? I’d say I like service and food best on Air New Zealand, but don’t like the herringbone seat. I can sleep fine on the BA, AA, and UA seats. Virgin would be the only one I would avoid because I cannot stand their particularly hard herringbone seat.